Reaching emergencies in time to save lives isn't always a matter of sheer power – sometimes tough terrain means that even the most capable wheeled vehicles simply can't get through. At CES 2019, Hyundai showed off a new concept vehicle that could make it easier to reach victims of natural disasters: a 'walking car', which uses articulated legs to navigate off-road following floods, fires and earthquakes. The vehicle, named Elevate, combines tech from electric cars and quadruped robots (like Boston Dynamics' SpotMini). 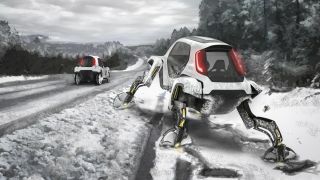 Each of its legs is also equipped with a wheel, enabling it to either drive or walk to its destination – or both. When the car is in drive mode, the legs are folded up and power to the joints is cut to extend battery life. However, when the going gets tough, it can adopt either a reptilian or mammalian gait, and leap across five-foot gaps. That's not something you could say of your typical 4x4. "When a tsunami or earthquake hits, current rescue vehicles can only deliver first responders to the edge of the debris field. They have to go the rest of the way by foot. Elevate can drive to the scene and climb right over flood debris or crumbled concrete," said John Suh, vice president and head of Hyundai's Center for Robotic-Augmented Design in Living Experiences (CRADLE). It's not just for emergencies, though; if Elevate could be driven autonomously, it could improve the lives of wheelchair users without access to a stair ramp, climbing to their front door so they can manoeuvre their chair straight in. We might not see Elevate attending to natural disasters or roaming the streets imminently, but it's not just for show; Hyundai has been working on the concept with industrial design consultancy Sundberg-Ferar for almost three years.